In order to properly manage a client’s case and protect their interests, it is often essential for us to bring on board various experts. Either pre-separation or when children are having difficulty transitioning to a two household arrangement, a child specialist can help guide parents on how to discuss separation and divorce with their children and how to implement strategies which are tailored to the developmental stage of the child. This can often help facilitate positive co-parenting at the early stages of the process. It is sometimes the case that a client can feel somewhat overwhelmed by the process. An individual therapist can help the client work through the emotions, teach coping skills, and prepare them for the next chapter of their life. It is not uncommon for a client to have previously been in couples counseling. However, there are two forms of couples counseling which can prove very beneficial in the separation and divorce process. Discernment counseling is when a couple works with a counselor for several sessions strictly to determine whether they will separate or work on reconciliation. Separation counseling is when a couple works with a counselor to establish ground rules, expectations and common goals for working together post-separation/post-divorce in a way that is productive and not destructive. We have found that the odds for a client to reach a successful outcome increase dramatically with this type of counseling. If there is estrangement between a parent and a child regardless of how that came to be, family therapy can be invaluable in helping to restore those bonds. Very often, the first step is to determine what a house, business or other asset is actually worth before we can evaluate options for how it will be divided. The family home is usually a center piece of the puzzle in dividing assets. Preplanning is the key to determining whether one party can buy out the other’s interest in the home and evaluating future housing options and needs. Joint versus separate tax filing; evaluating tax implications of asset division; financial planning and retirement planning in the post-asset division world; evaluating income, expenses, child support and alimony models; business buyout; alimony buyout; offsetting assets, etc. These are just a few of the significant financial decisions which will have a major impact on the rest of your life and where expert guidance is essential. If you have been out of the workforce for a period of time, a plan may need to be developed for further education, work training and experience before earnings can be maximized. If a spouse or partner is not earning as much as they could, an expert may be needed to provide an opinion on their income earning potential and appropriate level of imputed income. 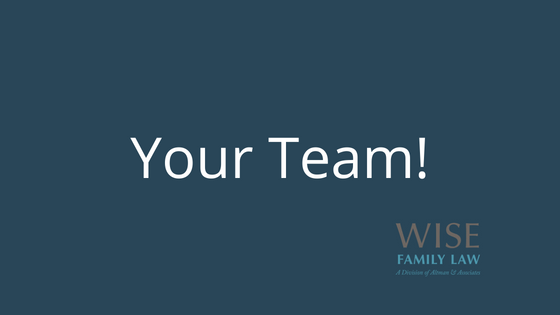 At Wise Family Law Division, we also recognize that family law encompasses all aspects of family. Our clients and those they care most about will often have additional legal needs such as employment matters, immigration matters, criminal law matters, personal injury matters, bankruptcy matters, business matters, tax matters, real estate matters and other pressing legal issues. We have made a commitment to maintain close relationships with the best legal professionals in every significant practice area so that we can make confident referrals and know our clients will be well protected.